I have no issue speaking my peace, directing criticism, or saying that I think something is wrong. What I do have a problem with is doing any of those things the wrong way. I don’t criticize just to cause trouble or to craft an imaginary world were my crap doesn’t stink; I criticize because I believe that we all have a responsibility to make Heathenry/Asatru the best it can be…and pretending that I don’t see problems is not going to make them go away. After all, this is the legacy we are intending to leave future generations. We are, functionally, only now passing into the second generation of our revival…and the decisions and choices we make carry weight beyond our years and our comprehension. Often, this causes me to take my time and choose the words I use with the utmost caution and care. I want positive change, and positive change means practicing some mindfulness. There are times, however, where no amount of mindfulness can help the discussion. The is no room for constructiveness in the criticism one gives to someone who for is acting in a way that is, fundamentally, non-constructive. These are the situations I tend to avoid, because I feel that no good can come from the majority of them. This is not one of those times, much to my distress, so it’s time to hold people to account. What I saw, in the last few weeks, was something that bothered me more than I can explain. Threats, childish sulking, passive aggression, and just plain inappropriate behavior along ever conceivable metric, and all of it coming from a single person. I heard accounts of threats made to ruin writing careers. I saw smug attitudes and condescension. I saw self-congratulation for virtues that did not exist. What happened, you ask? Well, an author (Bryan Wilton) wrote a book, had it self published on Amazon, and he got bad reviews for it. Five of them, to be exact. That’s was it. No one was bleeding. No one had died. No one had anything stolen from them, and the physical safety of this man was never in question to the best of my knowledge. All that happened was someone got their ego bruised. Nothing more. For the purposes of clarity alone, the organization he is talking about here is the AFA*. Oh, by the way? The second comment’s claim that all criticism had been addressed is a bold faced lie. The author, at time of writing, has done nothing to meaningfully address any valid criticism made of the book. I also reviewed the book myself, and the review was not positive. Feel free to look at it yourself, but there is nor reason to go into the books flaws here. Read my review, or any of the other four negative reviews originally posted about it; they’re all pretty accurate as far as I am concerned. I accidentally posted it anonymously, however, which led to a small confrontation with another person on Amazon. This user, named “Bryan” (no last name), demanded I have the courage to actually use my name. I corrected the mistake immediately, and than looked at “Bryan’s” list of reviews out of curiosity. Like me, he had only reviewed one book. Like me, it was also a review of a Bryan Wilton book. Unlike me, the review was absolutely positive and glowing. Strangely enough, a week later “Bryan” went anonymous…and than wrote two negative reviews for books by other Heathen authors. 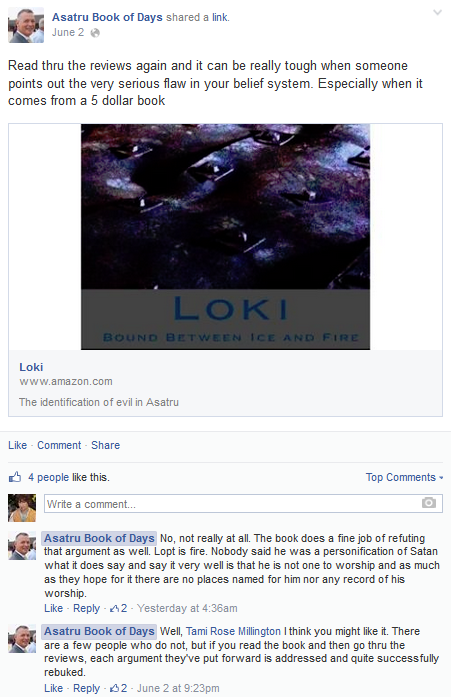 Neither of these reviews were made for confirmed purchases, and both of these authoresses (Erin Lale and Larissa Hunter**) had written bad reviews for…you guessed it, the book on Loki that Mr. Wilton had just published. This is no coincidence. These are is revenge reviews. The author said he was going to do it, and statements made on his fan page suggest that he wanted others to do them as well. As an example, he posted a link to some of the negative criticism he received. There was no link that I could find around the same time that connected people with the positive reviews he received…only his detractors. It’s almost as if the five bad reviews were more important than the good ones, and he wanted to call his fan’s attention to the people who didn’t like his work. Those with psychology backgrounds will notice this behavior is a standard activity for those who use coercion and aggression to get their way. Mr. Wilton’s behavior is the providence of bullies, and it’s disgusting that he thinks this behavior is warranted or even acceptable. All because five people thought his work was bad. Mr. Wilton, I will not post this review of your behavior anonymously. Here it is; nice and public. I’m Harrison K. Hall, and you know exactly where to find me. Go ahead and take down your threats and recriminations; I’ve seen you do it in the past and I know you’ll do it again. I already have proof of your misconduct…so do whatever you like. Just know that your actions are the lowest I have seen to date, and that what you do projects a man who has no business talking to anyone about what he feels is the difference between right and wrong. Not in Heathenry. Not even in a pre-school. You’re threatening and pushing other authors around for the “crime” of not liking your work, and you are administrating that punishment with empty threats and lies. That’s flatly unacceptable from any standard of Heathen ethic. Maybe if you were willing to do it publicly, with your name attached to that criticism, you’d have a sliver of credibility. At least then you would have the courage to stand up for your deeds with your own name. You didn’t however, so you don’t. You just want people who dislike your work shamed into silence. Interesting little tidbit, by the way: both authors you’ve slandered, thus far, are women. That’s amusing…because I haven’t seen any such malcontented nonsense directed at my blog…and you definitely know that I wrote a review. Also, I didn’t see any recent “anonymous” reviews for Bryon Morrigan either…another author (the author is Heathen, but his books are not) who thought your book was unacceptably poor. Seems like men get the pass, but the author of “Divine Feminism in Asatru” can’t handle criticism from females. Say what you’d like about people handing out review copies without your permission (at least, I think that’s your excuse for slander)…at least their reviews are based on your work. You’re just lying about the work of other people because they disagree with you, and that’s just deplorable…and the fact that you’ll only address women in this way just makes it creepy and disturbing. All of these actions are to the side of the biggest issue I have of all; you wrote a book to help identify “evil within Asatru”, yet you acted more evil and malicious than any Lokean I have ever known…and you have no idea what it takes for me to say that. The content didn’t bother me much, because I believe in a God that is larger, more powerful, and more pervasive than anything you can jam into a poorly edited PDF file. It annoyed me that you were going to sit there and pontificate for forty whole pages about how evil other people are in a religion that doesn’t give much of a damn for the standard good/evil binary…but I was content to write my review and have that be that. Havamal 125 and all that. Than you crossed a line, an ethical line at that, and became everything you accused other people of being in a single stroke. Instead of just accepting your detractors and moving on, you opted to hide your shortcomings and deny them. This is evil; it is not a state of being anyone should strive for much less emulate and boast of. It does not indicate spiritual growth and speaks volumes about your mental health. Does that sound familiar? It should because it is a direct quote, modified only for purpose of tense, that comes from page six of your own book. I will not be making fake reviews of your other works, as tempting as it may be. I will not engage in a stupid game of threats with you, because that will bring me down to your pitiful level. Nothing will be gained by harassing you, and I do not suggest anyone try to teach you a lesson by doing the same things; stooping to you level would make Heathenry worse, not better…and Heathenry is more important to me than seeing you feel the same spite you throw at others. What I will do, however, is expose you to the community at large. I will make sure that your pettiness, abusiveness, and bulling is on showcase, and can be proven with your words. Not just to Lokeans, but to all Heathens. Because these deeds, whether you follow the AFA’s Nine Noble Virtues, my Ten Tempers, another system, or nothing more pronounced than the dictates of your own ancestors reflecting within you soul, are in opposition to anything that could be considered acceptable in Heathen ethics***. Everything you wrote about Loki and his veneration has more to do with you, the writer, than it does to do with anything that occurs within any sect of Heathen spirituality. Deal with the criticism, man up, and for the sake of the Gods and the Folk who you are supposed to be building? Learn how to behave like the damned Asatruar, Folk Builder, and Clergy you claim you deserve to be. Stop worrying about the “evils” of Loki worship and start concerning yourself with your own deeds. I do not know what your deeds, in your personal and private life, say about you…but the ones you’ve put forth online, within Heathenry, are some of the absolute worst I have ever seen. To my readers, I apologize for having to go in this sort of direction because it’s an absolute last resort. I don’t like it, but sometimes such things are necessary. That being said, unless Mr. Wilton’s actions in the future are such that they speak of misconduct that I believe the community must be informed about, I will doing my best to never breech this subject or talk about him on this (or any other) blog ever again. *To the Board of Directors, Folk Builders (who are not Bryan Wilton), and Members of the Asatru Folk Assembly , allow me to say this…until such a time as you, collectively, stand up in favor of Mr. Wilton’s actions or passively permit this level of misconduct and lies through a track record inaction? I’m not holding you responsible for this nonsense. Differences in philosophy and and beliefs aside, I don’t think this is how you want to present yourselves and I operate under the presumption that you guys are better than this until I am shown otherwise. To be plain about it, we may very much disagree on matters of what folkism or metagenetics indicate or mean and, in some cases, disagree very vigorously…but we can both agree, I should think, that Mr. Wilton’s deeds fall outside of any categorization of acceptability or ethics. ** In the interest of full disclosure, I am a student in Larisa Hunter’s clergy program (aka Gods Person Training Program) over at Kenaz Kindred. She did not request that I write this article and had no input as to it’s content, though she did share with me some of her experiences in this situation which I included and/or excluded at my own discretion. No one at Kenaz Kindred or within the Gods Person Training Program has any authority over what I write here, or on any other blog, and any attempt to exert such influence via my membership in the aforementioned clergy program would result in my immediate resignation from that program. As that has not happened, and as all interactions with Kenaz Kindred, The Gods Person Training Program, and Larisa Hunter have been completely ethical and professional in nature, I do not foresee that ever being a concern. What you read here is completely, one-hundred percent, my own words…and it shall always remain so. ***Let me be clear here: that was not a sly way to infer that we should give Mr. Wilton his just dues while making a token gesture of “discouraging” harassment in kind. I am dead serious, and I hope no one engages in this behavior. The worst thing we can do is try to give this scornful egotist a taste of “his own medicine” because people like him live on attention and notary…and it doesn’t need to be positive. No, let him and his “works” be forgotten. He does not deserve acknowledgement, beyond making his misdeeds public so he can be seen for what he is and handled accordingly.